The Institute of Door Dealer Education and Accreditation (IDEA) was created by a coalition of overhead door organizations to enhance the ability of consumers to recognize professionalism within the door and access systems industry. IDEA Dealer Accreditation is provided to dealers who have demonstrated a high commitment to quality and exceptional level of knowledge in a variety of facets of the door and access systems industry. By choosing an IDEA Accredited Door Dealer, consumers can have confidence that the dealer is among those who have completed a six-part course, passed rigorous examinations and provided other documentation items documenting quality business practices. Brookline Doorworks is an A+ Accredited Business. An accredited business must build trust by establishing and maintaining a positive track record in the marketplace, honestly represent products and services, be transparent, honor promises, be responsive, and embody integrity. 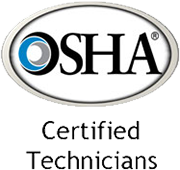 The OSHA Training Institute provides training and education in occupational safety and health for federal and state compliance officers, state consultants, other federal agency personnel, and the private sector.